It’s rare that people make their lunch anymore. Adults don’t really have the time, especially on a weekday, to wander through their kitchens and throw something together. Restaurants capitalize on their customer’s tendency to dine out at this time of day, offering shorter versions of their delicious menus for reduced prices. 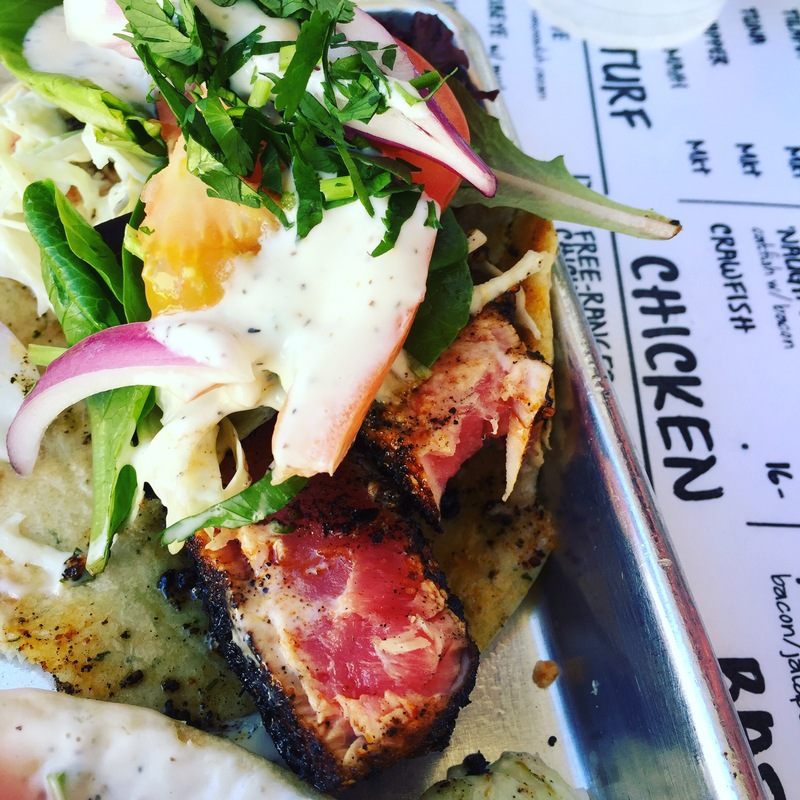 If you haven’t tried that high end place downtown, go for lunch! Much friendlier on the wallet, and rarely a wait. Dining out is one of my favorite ways to spend money. I LOVE to cook, but I almost love it more when someone cooks for me, especially someone with enough clout to please the masses in a well-designed space. So why, I am asked, do I so rarely go out for lunch? Financials are one thing, but really it’s a matter of time. With the limited amount of time allotted for a lunch break, a restaurant ceases to be an enjoyable place for me. It also loses its “reasonable” price tag. I’m worried about flagging down the server for the check, I usually end up ordering something practical (read: boring) and no matter how much money I spend, I can’t really sink into that banquette and enjoy myself. In Europe, midday meals are more my style. When I was in Italy, and then later in Spain, I was shocked to notice how much time folks spent dining and chatting, even at lunchtime. They let the food come at its own pace, eating and laughing as if the word “Monday” and its accompanying angst is not a part of their vocabulary. Don’t give me the “their economy is in the toilet” speech. I’ve heard it, and it’s boring, and it doesnt convince me of anything. They know how to eat over there, and that’s a damn fact. Over here, restaurant lunch specials aside, the mid-weekday meal has become the afterthought of our day’s culinary journey–that pitstop that no one remembers when they look back a week later. Look around the average office one day and just observe how folks spend their free hour. Lean Cuisines abound, greasy brown bags of down-the-street grub made their way up the elevator, and more often that not, you see folks take their lunch break at their desk or while staring at their phone. As for me, lunch did not hold true significance until adulthood decided to get up and smack me in the face. In high school, my mom’s idea of a packed lunch was a bagel and a Capri Sun thrown into a brown bag to look the part. To be fair, even when my dad used the gorgeous roast beef from the night before to craft a masterpiece of a sandwich for our packed lunches, I was far too interested in my social life over the lunch hour to really enjoy it. College? Too poor. Law school? Too busy to mess with the midday meal. It’s the concept of the “lunch break,” a decades old figment of our nine-to-five, that brought the meal to my attention recently. It takes about 12 minutes each way to get home from my office on the lunch hour, which means that my “downtime” is very short. I often ask myself why I do it — why not wander to one of the dozens of downtown lunch destinations, teeming with specials, or maybe just pack a lunch and eat at the office? It would mean more time for “me,” less time in the car, and would still amount to an escape from the confines of my cubicle. My answer to myself, as I fly down South First Street, is this: when I go home, I get to make something. I get to take part in an activity that has absolutely nothing to do with work, surrounded by non-work things like my tiny shiba inu or the shady pleasure of our front porch. I feel the satisfaction of having succeeded at something creative, and my mind has no choice but to concentrate on that. 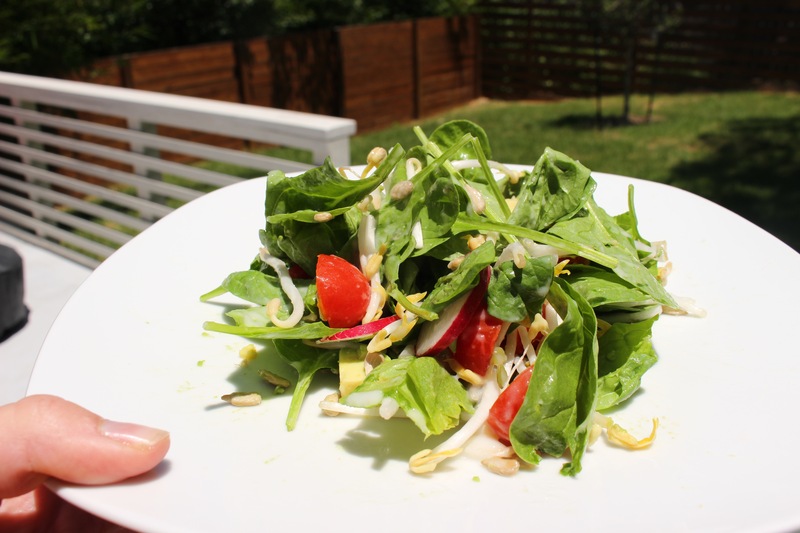 A quick weekday salad of baby spinach, sprouts, avocado, tomato, fresh basil, sunflower seeds and vegan coconut ranch dressing. See recipe page for deets. 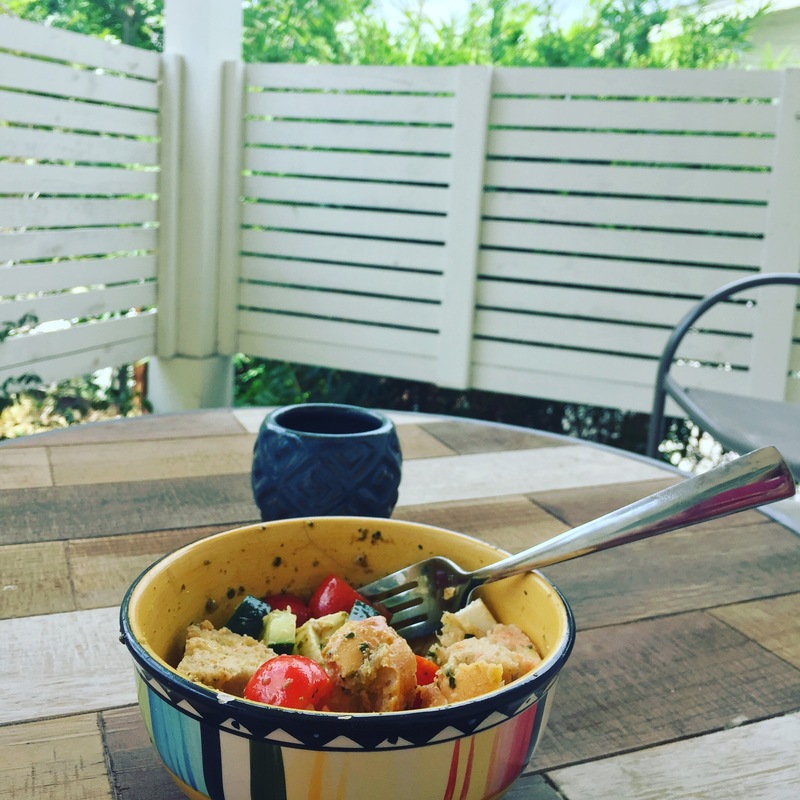 Once I realized that I could feasibly drive home from work to eat lunch a few times a week, I began perfecting the art of the five minute lunch. Half of its success comes from preparation, which is far from what you’re thinking it is. My “meal prep” involves me sitting at my desk at work, visualizing what is in my fridge and brainstorming how I can craft it into some kind of meal. This week, I had a beautiful ball of mozzarella, a few local tomatoes, an almost-depleted container of pesto, half a cucumber, and some crusty ciabatta bread that was on its way out. 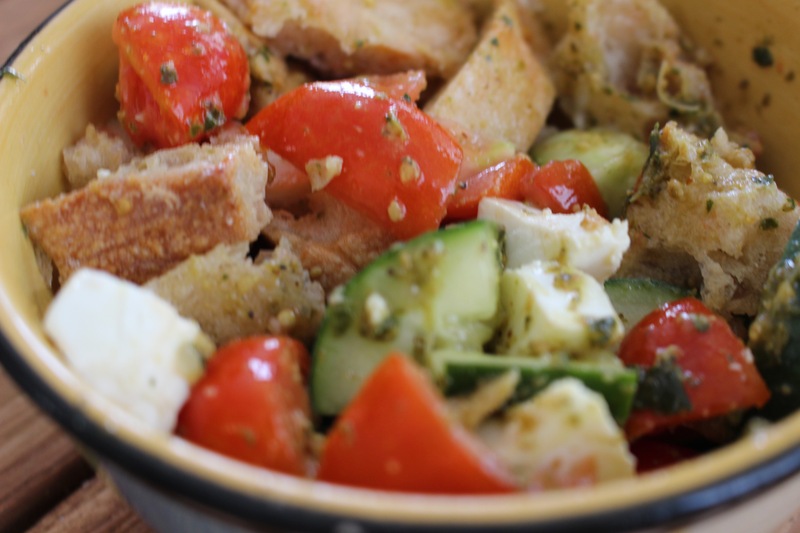 Always Italian food minded, I was thrilled to discover that I had the makings of pretty basic panzanella. And so I rushed home, impatient with even the slightest trickle of traffic, busted open the front door, and got to work to escape from work. I focused on soaking the bread first. I cut the (quite stale) ciabatta bread into rough cubes and immediately began squeezing the halved cherry tomatoes on top of them, throwing the juicy pieces in with the bread. (Panzanella is better if you toast the bread in the oven first, but we aren’t going for gold here.) A swirl of olive oil and a dash or two of red wine vinegar provides additional moisture; I let it sit while I prep the remainder of the ingredients. I cubed the cucumber and the mozzarella into bite sized pieces, dolloped some of the pesto on top at the end and tossed it all together. If I had had fresh basil, I would have chopped it up with some fresh garlic in lieu of the pesto. The second round of soaking happened while I tidied up my little kitchen mess. Three words: BUY GOOD BREAD. It will serve you far longer than you think. It’s not perfect, as the bread doesn’t have enough time to reach the just-soggy-enough texture it should have, but it works. It’s the tastiest 5 minute panzanella you’ve ever made in your life. And there’s still plenty of time to spare to take part in my other favorite lunchtime activity: starting off into space, trying to psych myself up for another half day at work. As I’ve gotten older, it has become apparent to me that I am not one of those people who lives to work. I always liked school, and did well, but I think that was due to the vast variety of subjects explored, the ever-changing nature of the schedule and the tasks, and the fact that there was no mortgage or utility bill that was causing me to show up every day. My work now is not my passion, but even when I worked for a cause that I truly believed in, I grew tiresome of the day to day. And so, if making lunch, this lost and forgotten art form, can save me from monotony, and give my creative brain an extra boost, I’m all for it. I get an hour, in the middle of every day, to escape the reality of adulthood and do whatever I want. It doesn’t always involve eating, mind you, and my rational side often carries me to the most mundane of errands at the midday hour, but most of the time, I eat. And damnit if I want it to be good.